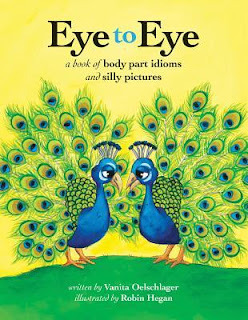 Synopsis: Eye to Eye shows children the magic of idioms words that separately have one meaning, but together take on something entirely different. Children are curious about words, especially phrases that make them laugh (Stick Your Neck Out) or sound silly (All Ears). Eye to Eye uses outlandish illustrations of what the words describe literally. The reader then has to guess the real meaning of the phrases (which are at the bottom corner of the spread). At the end of the book, the reader is invited to learn more about these figures of speech. Review: Another great book explaining common idioms used in everyday life, presented in a way that kids can understand easily. The pictures are fun literal interpretations of the idioms. Once again I can't recommend this book enough, and I can't wait to see the other books the author has published. About the Author: Vanita Oelschlager is a wife, mother, grandmother, former teacher, current caregiver and, for almost ten years, author and poet. Today, as an accomplished author, Vanita shares openly the experiences that she, Jim and their families have had with multiple sclerosis. She has likened MS to living with an elephant, one that won't go away or be ignored. Together, she and Jim have found ways to live with this "elephant" and to share some of the larger lessons about life they've learned through the disease.